Chiba is located in the middle of the main island of Japan, so it is on the eastern part of the island. Most foreigners visiting Japan do not know anything about Chiba prefecture, but most of them could have been visited Chiba once or more because of the Narita International Airport. The Narita International Airport is located on the middle of Chiba prefecture, therefore they could have been. Sometimes, NRT is called 'New Tokyo International Airport', it is only the name, Tokyo represents Japan itself, the word Tokyo always used to be. It means that Chiba prefecture is the entrance of Japan. Chiba prefecture is on the east side of Tokyo, so it is on the south east area of Kanto region. Its prefectural government is Chiba city. The most part of the land is in the Boso peninsula, so it means that the most the land of Chiba is surrounded by sea. The land has few ups and down, the tallest mountain in Chiba is Atagoyama, its heights is only 408. And its climate is mildest in Kanto region, so the floriculture is flourishing in the southern part of Boso peninsula. Additionally, there are many farm shops, with agriculture and tourism being united more and more. Of course, fishing industry is also prosperous in Chiba. Every seasons, millions of tourists visiting Chiba have much opportunity to eat much unique and delicious food during their trips. Turbines, spiny lobsters and so on from the sea, pears, loquats, strawberries and peanuts are famous for its particular special. 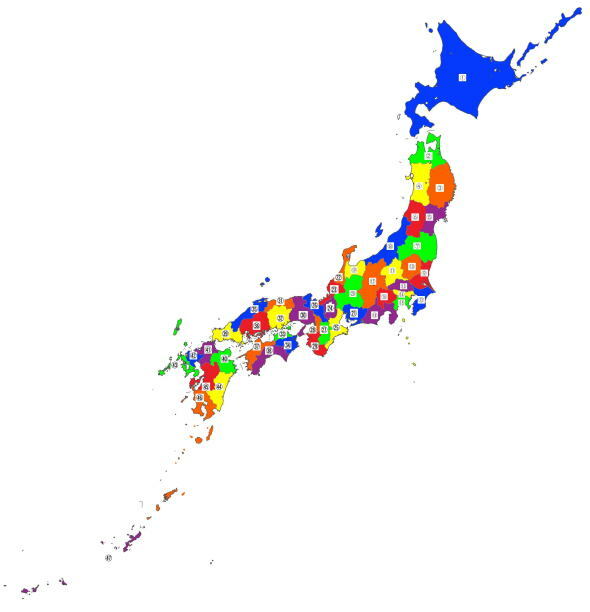 Now Chiba prefecture was originally united 3 classic administraive districts in Japan, Awa, Kazusa and Shimousa. According to one of Japan classic or myth 'Kogoshui', Ame-no-tomi-no-mikoto took Inbe Clan in Awa to move east and caltivate hemps. At that time, they got high quality hemp harvested there, then they called there 'Fusa' (old word implies hemp), and it was divided into two districts, the southern part was named Kazusa, and northern one was Shimousa. And Inbe from Awa stayed the southern parts of Chiba prefecture where they named Awa. In general, Japanese calls Chiba regoin Boso, it was made by the united the Chinese letters of Fusa and Awa. During Kamakura period, Chiba Clan seized the power at Boso area. In Sengoku period, Satomi Clan controlled Awa and had strongly influential power to Kazusa and Shimousa. Since Ieyasu Tokugawa held the power to control Japan and founded Edo Bakufu (Edo Shogunate) at Edo (Tokyo), the most parts of Boso were directly controlled by Edo Bakufu (Tokugawa Clan), and rest of it belonged to the small lords who had hired by the Bakufu directly, because Boso was very important area to keep the Bakufu stabily in Edo Period. After Meiji Restoration, the classical districts were rebuilt, and a new administrative district 'Chiba' was created in June 15th of 1873. Chiba was named after the land name where the seat of prefectural government was built in Chiba-cho, Chiba-gun. But there are more stories about that, one said that Chiba means thousands leafs, therefore it implies much harvest, much green in the land and flourishing the land and the descendants. Now the population of Chiba prefecture is over 6 million. Every seasons flowers bloom in the mild climate. There are unique leasure spots and some big shopping malls with much gift form the earth and seas. Moreover, there are many cultural and historical spots remains, Katori-jingu Shrine, Narita-san Shinsho-ji Temple and Nakayama Hokekyo-ji Temple have the famous historical buildings, Sawara area saved the historical landscape. Of course, the sea is the most exciting spot of Chiba. The climate is easy to live, therefore over 6 million people live in Chiba. Why don't you visit Chiba? After you arrived at Narita International Airport, please trip at Chiba.